^ "tintbook.com". Archived from the original on 10 March 2007. Retrieved 30 September 2014. Anaglyph 3D is the name given to the stereoscopic 3D effect achieved by means of encoding each eye's image using filters of different (usually chromatically opposite) colors, typically red and cyan. Anaglyph 3D images contain two differently filtered colored images, one for each eye. When viewed through the "color-coded" "anaglyph glasses", each of the two images reaches the eye it's intended for, revealing an integrated stereoscopic image. The visual cortex of the brain fuses this into the perception of a three-dimensional scene or composition. Anaglyph images have seen a recent resurgence due to the presentation of images and video on the Web, Blu-ray Discs, CDs, and even in print. Low cost paper frames or plastic-framed glasses hold accurate color filters that typically, after 2002, make use of all 3 primary colors. The current norm is red and cyan, with red being used for the left channel. The cheaper filter material used in the monochromatic past dictated red and blue for convenience and cost. There is a material improvement of full color images, with the cyan filter, especially for accurate skin tones. Video games, theatrical films, and DVDs can be shown in the anaglyph 3D process. Practical images, for science or design, where depth perception is useful, include the presentation of full scale and microscopic stereographic images. Examples from NASA include Mars Rover imaging, and the solar investigation, called STEREO, which uses two orbital vehicles to obtain the 3D images of the sun. Other applications include geological illustrations by the United States Geological Survey, and various online museum objects. A recent application is for stereo imaging of the heart using 3D ultra-sound with plastic red/cyan glasses. Anaglyph images are much easier to view than either parallel (diverging) or crossed-view pairs stereograms. However, these side-by-side types offer bright and accurate color rendering, not easily achieved with anaglyphs. Recently, cross-view prismatic glasses with adjustable masking have appeared, that offer a wider image on the new HD video and computer monitors. Aqua (Latin for "water") is a greenish-blue color, a variation of the color cyan. The web color aqua is identical to the web color cyan, also sometimes called electric cyan, one of the three secondary colors of the RGB color model used on computer and television displays. In the HSV color wheel aqua is precisely halfway between blue and green. However, aqua is not the same as the primary subtractive color process cyan used in printing. The words "aqua" and "cyan" are used interchangeably in computer graphics, and especially web design, to refer to the additive secondary color "cyan". Both colors are made exactly the same way on a computer screen, by combining blue and green light at equal and full intensity on a black screen. Traditionally, that color, defined as #00FFFF in hex, or (0,255,255) in RGB, is called "cyan", but X11 color names introduced the alternative name "aqua". Later, W3C popularized the name by using it in the named color palette of HTML 3.2 specifications. Aquamarine is a color that is a light bluish tint of green that is in-between cyan and spring green on the color wheel. It is named after the mineral aquamarine, a gemstone mainly found in granite rocks. The first recorded use of aquamarine as a color name in English was in 1598. Blue-green is a color that is a representation of the color that is between green and blue on a typical traditional old-fashioned RYB color wheel. Blue-green belongs to the cyan family of colors. 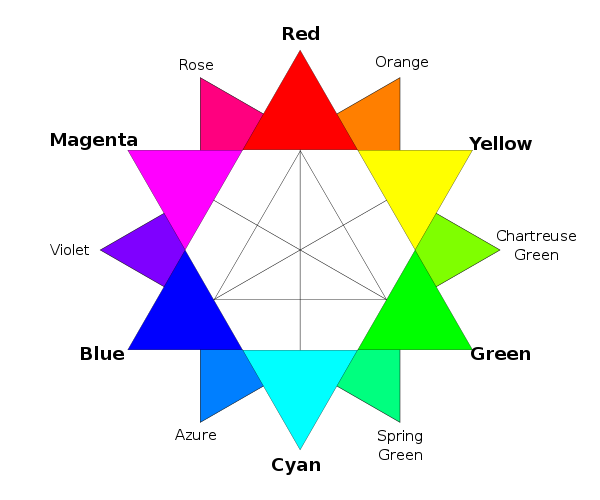 The CMYK color model (process color, four color) is a subtractive color model, used in color printing, and is also used to describe the printing process itself. CMYK refers to the four inks used in some color printing: cyan, magenta, yellow, and key. The CMYK model works by partially or entirely masking colors on a lighter, usually white, background. The ink reduces the light that would otherwise be reflected. Such a model is called subtractive because inks "subtract" the colors red, green and blue from white light. White light minus red leaves cyan, white light minus green leaves magenta, and white light minus blue leaves yellow. In additive color models, such as RGB, white is the "additive" combination of all primary colored lights, while black is the absence of light. In the CMYK model, it is the opposite: white is the natural color of the paper or other background, while black results from a full combination of colored inks. To save cost on ink, and to produce deeper black tones, unsaturated and dark colors are produced by using black ink instead of the combination of cyan, magenta, and yellow. Cyan Racing is the official motorsport partner to Geely Group Motorsport, formerly the Volvo factory auto racing team, and runs the FIA WTCR programme for Lynk & Co, based in Gothenburg, Sweden. The team’s current drivers are Thed Björk, Yvan Muller, Yann Ehrlacher and Andy Priaulx who will drive the Lynk & Co 03 TCR race car. The team was founded by Jan "Flash" Nilsson as Flash Engineering in 1996. Christian Dahl bought the team in 2005 and renamed it Polestar Racing. After Dahl sold the Polestar performance road car division to Volvo, the team was renamed Cyan Racing. Cyan Inc., also known as Cyan Worlds Inc., is an American video game developer, founded as Cyan Productions by brothers Rand and Robyn Miller in 1987, and best known as the creators of the Myst series. After Myst and its sequel Riven sold several million copies each, Cyan went on to create the massively multiplayer online adventure, Uru, which was cancelled and re-opened several times. After the departure of brother Robyn Miller from "Cyan, Inc.," a second company, "Cyan Worlds, Inc.," was started. Both companies are located in Mead, Washington, just outside Spokane. Dye coupler is present in chromogenic film and paper used in photography, primarily color photography. When color developer reduces ionized (exposed) silver-halide crystals, the developer is oxidized, and the oxidized molecules react with dye coupler molecules to form dye in situ. The silver image is removed by subsequent bleach and fix processes, so the final image will consist of the dye image. Dye coupler technology has seen considerable advancement since the beginning of modern color photography. Major film and paper manufacturers have continually improved the stability of the image dye by improving couplers, particularly since the 1980s, so that archival properties of images are enhanced in newer color papers and films. Generally speaking, dye couplers for paper use are given more emphasis on the image permanence than those for film use, but some modern films (such as Fujichrome Provia films) use variants of couplers that were originally designed for paper use to further improve the image permanence. This is a list of colors and a brief description. Myst is a franchise centered on a series of adventure video games. The first game in the series, Myst, was released in 1993 by brothers Rand and Robyn Miller and their video game company Cyan, Inc. Riven, the sequel to Myst, was released in 1997, and was followed by three more direct sequels: Myst III: Exile in 2001, Myst IV: Revelation in 2004, and Myst V: End of Ages in 2005. A spinoff featuring a multiplayer component, Uru: Ages Beyond Myst, was released in 2003 and followed by two expansion packs. Myst's story concerns an explorer named Atrus who has the ability to write books which serve as links to other worlds, known as Ages. This practice of creating linking books was developed by an ancient civilization known as the D'ni, whose society crumbled after being ravaged by disease. The player takes the role of an unnamed person referred to as the Stranger and assists Atrus by traveling to other Ages and solving puzzles. Over the course of the series Atrus writes a new Age for the D'ni survivors to live on, and players of the games set the course the civilization will follow. The brothers developed Myst after producing award-winning games for children. Drawing on childhood stories, the brothers spent months designing the Ages players would investigate. The name Myst came from Jules Verne's novel The Mysterious Island. After Riven was released, Robyn left Cyan to pursue other projects and Cyan began developing Uru; developers Presto Studios and Ubisoft created Exile and Revelation before Cyan returned to complete the series with End of Ages. Myst and its sequels were critical and commercial successes, selling more than twelve million copies; the games drove sales of personal computers and CD-ROM drives, as well as attracting casual gamers with its nonviolent gameplay. The video games' success has led to three published novels in addition to soundtracks, a comic series, television and movie pitches. Riven is a puzzle adventure video game and the sequel to Myst. Developed by Cyan Worlds, it was initially published by Red Orb Entertainment, a division of Brøderbund. Riven was distributed on five compact discs and released on October 31, 1997, in North America; it was later released on a single DVD-ROM, with improved audio and a fourteen-minute "making-of" video. In addition to the PC versions, Riven has been ported to several other platforms. The story of Riven is set immediately after the events of Myst. Having been rescued from the efforts of his sons, the main non-player protagonist Atrus enlists the help of the player character to free his wife from his power-hungry father, Gehn. Unlike Myst, which took place on several worlds known as Ages linked together by special books, Riven takes place almost entirely on the Age of Riven, a world slowly falling apart due to Gehn's destructive rule. Development of Riven began soon after Myst became a success, and spanned more than three years. In an effort to create a visual style distinct from that of Myst, director Robyn Miller and his brother, producer Rand Miller recruited former Aladdin production designer Richard Vander Wende as a co-director. Brøderbund employed a US$10 million advertising campaign to publicize the game's release. Riven was praised by reviewers, with the magazine Salon proclaiming that the game approaches the level of art. Critics positively noted the puzzles and immersive experience of the gameplay, though publications such as Edge felt that the nature of point-and-click gameplay limited the title heavily. The best-selling game of 1997, Riven sold 1.5 million copies in one year. After the game's release, Robyn Miller left Cyan to form his own development studio, ending the professional partnership of the two brothers. Rand stayed at Cyan and continued to work on Myst-related products including The Myst Reader and the real-time rendered game Uru: Ages Beyond Myst. The next entry in the Myst series, Myst III: Exile, was developed by Presto Studios and published by Ubisoft. This article is about notable tints and shades of the color cyan, a greenish blue. Cyan is one of the subtractive primary colors- cyan, magenta, and yellow. The first recorded use of cyan blue ("cyan blue" was the name used for the color "cyan" in the 19th century) as a color name in English was in 1879. Teal is a medium blue-green color, similar to cyan. Its name comes from that of a bird—the common teal (Anas crecca)—which presents a similarly colored stripe on its head. It can be created by mixing blue into a green base, or deepened as needed with black or gray. The complementary color of teal is maroon. It is also one of the initial group of 16 HTML/CSS web colors formulated in 1987. In the RGB model used to create colors on computer screens and televisions, teal is created by turning down the brightness of cyan to about one half. The first recorded use of teal as a color name in English was in 1917. The word is often used colloquially to refer to shades of cyan in general, including the color cyan itself, most notably in computer games where one of the players is cyan. Teal was a fad color during the 1990s, with, among others, many sports teams adopting the color for their uniforms. In computing, on the X Window System, X11 color names are represented in a simple text file, which maps certain strings to RGB color values. It was traditionally shipped with every X11 installation, hence the name, and is usually located in /lib/X11/rgb.txt. The web colors list is descended from it but differs for certain color names.Color names are not standardized by Xlib or the X11 protocol. The list does not show continuity either in selected color values or in color names, and some color triplets have multiple names. Despite this, graphic designers and others got used to them, making it practically impossible to introduce a different list. In earlier releases of X11 (prior to the introduction of Xcms), server implementors were encouraged to modify the RGB values in the reference color database to account for gamma correction.As of X.Org Release 7.4 rgb.txt is no longer included in the roll up release, and the list is built directly into the server. The optional module xorg/app/rgb contains the stand-alone rgb.txt file. The list first shipped with X10 release 3 (X10R3) on 7 June 1986, having been checked into RCS by Jim Gettys in 1985. The same list was in X11R1 on 18 September 1987. Approximately the full list as is available today shipped with X11R4 on 29 January 1989, with substantial additions by Paul Ravelling (who added colors based on Sinclair Paints samples), John C. Thomas (who added colors based on a set of 72 Crayola crayons he had on hand) and Jim Fulton (who reconciled contributions to produce the X11R4 list). The project was running DEC VT240 terminals at the time, so would have worked to that device.In some applications multipart names are written with spaces, in others joined together, often in camel case. They are usually matched insensitive of case and the X Server source code contains spaced aliases for most entries; this article uses spaces and uppercase initials except where variants with spaces are not specified in the actual code.